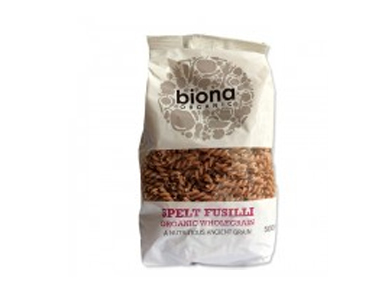 Order Biona Spelt Fusilli from the Online Health Food Store UK. Buy Biona Organic Spelt Pasta Wholegrain Fusilli - 500g and other quality Spelt & Wheat Pasta safely online in the UK. Spelt is one of the oldest cultivated grains (an ancient cousin of wheat). It is high in fibre, has a higher content of protein and vitamins than wheat and although not gluten free, Spelt can be tolerated by some people with wheat allergies. Where to buy Biona Spelt Fusilli safely online? Shop at the Online Health Food Store if you are wondering where you can buy Biona Organic Spelt Pasta Wholegrain Fusilli - 500g safely online in the United Kingdom. Spelt Fusilli - Biona Organic Spelt Pasta Wholegrain Fusilli - 500g in Spelt & Wheat Pasta and Dried Pasta.